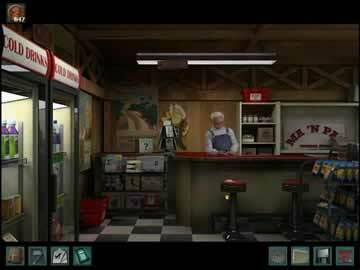 Nancy Drew: The Trail of the Twister Game - Download and Play Free Version! Nancy Drew: The Trail of the Twister brings all the fun and excitement of storm chasing to your computer screen. Solving cases while dodging tornadoes is quite the challenge, but it's nothing Nancy can't handle. If you're tired of the same old boring tutorials at the start of a game, you will really appreciate this one. You start out at Nancy Drew's desk, and you are invited to explore her workspace to get a feel for things. There is a nifty book on the table titled "How to be a Detective" that you can thumb through if you'd like a few pointers on how it's done, and this serves as the tutorial! Nancy also has a scrapbook on her desk chronicling her adventures during the other 21 games in her series. For newcomers to the Nancy Drew games, this is great news. Just don't tell her dad about the scary stuff, okay? One of the things that has made the Nancy Drew adventure game series so popular is the fact that these games consistently feature excellent storylines. In The Trail of the Twister, a man named P.G. Krolmeister has hired Nancy to go undercover as a new member of the storm research team he's been funding. A long string of accidents have him convinced that someone is sabotaging his research team. It's not a far-fetched theory either; the bad luck only started after the research team was in the running to win a $100,000,000 grant at the Green Skies storm competition. 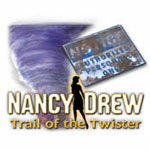 Nancy Drew has to really play the part if she wants to pass as an intern for the Canute Storm Chasers. Anything out of the ordinary could tip the bad guy off, and that would make unraveling this case much harder. Fortunately, Nancy isn't above getting her hands dirty. Oklahoma, here we come! A good detective explores everything. This game allows you to roam around and investigate every space. Nancy Drew always has her magnifying glass handy, and the cursor will change into a magnifying glass to indicate that you should take a closer look at certain areas. Curiosity is a sleuth's best friend, so explore away! Every Nancy Drew game has puzzles, but this one has even more than usual. Puzzle fans, rejoice! Puzzles appear organically throughout the storyline, making it feel very realistic. Designing the local tornado warning system, repairing a car's LED fuses, fixing the agricultural team’s sprinklers and more serve as challenging puzzles that move the storyline forward. There is a huge difference in difficulty between junior and senior modes in this game. Junior detectives are given a handy task list which enables them to keep track of everything that needs doing in order to progress in the story. Senior detectives are expected to remember everything for themselves, and this really amps up the challenge. The puzzles are also much harder for senior detectives. These two modes make this a game that anyone can play, and you will definitely want to play through at least twice. All of the characters in this game are complex and well thought out, and this makes the gameplay memorable for the long haul. The voice acting is excellent as well, so you will look forward to interacting with each and every character. The old house that serves as the headquarters of the Canute Storm Chasers looks fantastically realistic, just like all of the other landscapes and backgrounds in this game. The production quality is top notch, and the menus look awesome as well. The information Nancy Drew learns about weather during her time with the research team is all real and factual, giving this game some serious educational value. 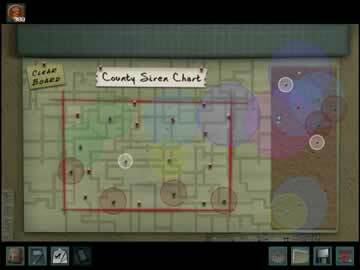 Overall, Nancy Drew: The Trail of the Twister is a wonderful game for puzzle and mystery lovers of all ages. Who is the saboteur, and what is their motivation? It's up to you to find out!